Around the world, runners have their own special way of celebrating New Year’s Eve: the festivities have to wait while they take to the streets and race. In the U.S. alone this year, there were hundreds of road races, big and small, heralding 2015. To mark this popular festive day for running, Take The Magic Step takes you around the globe to some of the exciting events with glittering fields held in New York, Italy, Spain, Brazil, Austria, and Germany. And if your New Year’s resolution includes taking part in one of these year-end events in the future, Uta’s 6-week training plan for beginners, “Run Your First 5K,” can guide you to a successful race day. We wish you much success, joy, and all the best for your training in the coming year! The fastest 5,000-meter runner of 2014, Muktar Edris, (12:54.83), won a long, neck-and-neck sprint for the finish line against fellow Ethiopian Imane Merga at the BOclassic Raffeisen New Year’s Eve race. 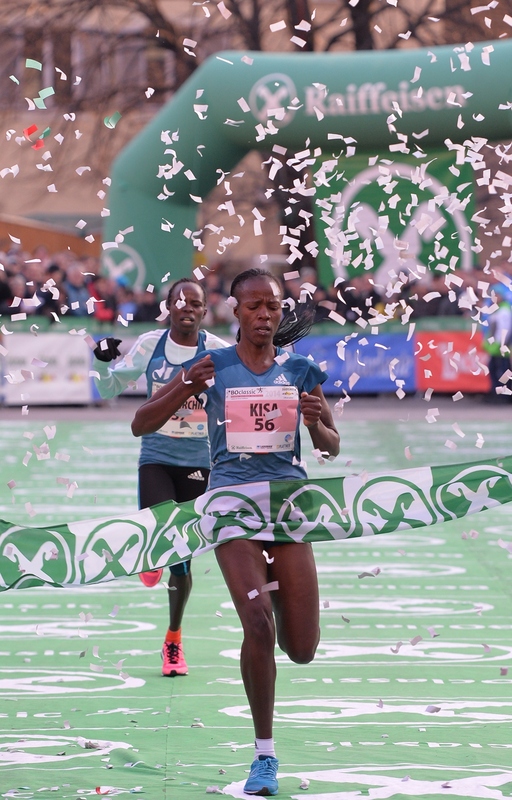 Two years ago, the result over 10K through Bolzano’s scenic Old Town was the reverse—Imane won in another sprint finish. This year, the 20-year-old Muktar finished two tenths of a second ahead of the triple winner and defending champion. Both were timed at 29 minutes and 7 seconds. New Zealand’s Zane Robertson was a surprise third. The pace for two-thirds of the 10K race was slow, setting up the final contest for the two fast-finishing Ethiopians. Imane Merga and Muktar Edris were able to drop Zane Robertson with 300 meters to go—and began the long sprint for the line running shoulder to shoulder. 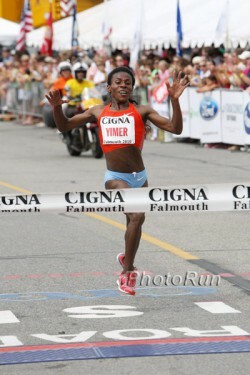 The 2012 World Junior Champion broke the tape half a meter in front of Imane. 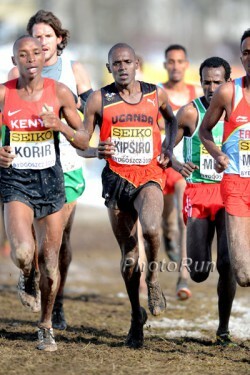 The other favorites, Edwin Soi and Thomas Longosiwa from Kenya, fell behind on the last of eight laps. But third place was a triumph for Zane Robertson—he became the first ever runner from an Oceanic country to make the podium in Bolzano. The 22-year-old Kenyan Janet Kisa won the women’s 5K race in the fastest time since 2006. Third in the African Championships at 5,000m, she triumphed in 15:49 by just one second over her compatriot, Peres Jepchirchir. The 18-year-old Ethiopian Alemitu Hawi finished third. Margherita Magnani also had a strong run. The Italian middle-distance runner was able to pass Ethiopia’s Etenesh Diro to take fourth. Local favorite Silvia Weissteiner finished behind Federica Del Buono in seventh place. The Spanish capital witnessed a great New Year’s Eve anniversary with the 50th edition of the 10K race. Mike Kigen of Kenya dictated tactics from the start, setting a fast pace that left all his rivals behind before the halfway point. Mike won in 27:51, with Spanish runners Jesus Espana (28:29) and Antonio Abadia (28:45) coming in second and third respectively. This year Mike Kigen is setting his sights on two marathons—Boston in the spring and Frankfurt in the autumn. Britain’s European Cross-Country Champion Gemma Steel once again showed good form, breaking away in the second half of the 10K, to win in 31:52. She was well clear of Morocco’s Malika Asahssah (32:18) and Christelle Daunay of France (32:24). Approximately 30,000 runners took part in Brazil’s “Corrida Internacional de São Silvestre,” the oldest New Year’s Eve race in the world, which celebrated its 90th anniversary in 2014. Over 15K, it came down to a tight finish in the men’s race, won by Ethiopia’s Dawit Admasu in 45:04. Stanley Koech of Kenya was just one second behind and Tanzania’s Fabiano Naasi took third in 45:10. The fastest woman was Wude Ayalew, Ethiopia’s bronze medalist from the World Championship 10,000m in Berlin in 2009, crossing the line in 50:43. Fellow Ethiopian Netsanet Gudeta (50:46) took second, while Kenyan Priscah Jeptoo (51:29) was third. In a stunning finish, Germany’s 25-year-old Richard Ringer shared first place with Kenya’s Victor Chumo, who matched him stride for stride in the final sprint of the men’s 6.8K race in Peuerbach. Both were timed at 19:04—a new course record. Further back was the defending champion Cornelius Kangogo in 19:23. Eritrea’s Jonas Habtemicael took fourth in 19:26. Richard Ringer has come to the fore in the last 12 months, with several strong performances in international races. A year ago he was seventh in the European Cross-Country Championships and he finished fourth in the European Championship 5,000m in Zurich in August. The women’s race also celebrated a course record in calm, 28-degree Fahrenheit conditions. Kenya’s Sheila Chepngetich ran 15:43 for the 5.1K distance, shattering the previous best—which had stood for 12 years—by 13 seconds. Her fellow countrywoman and pre-race favorite Betsy Saina, was second in 15:48. Perine Nengami (Kenya) finished third in 16:23. Last year’s winner, Amela Terzic of Serbia, was fourth in 16:36. 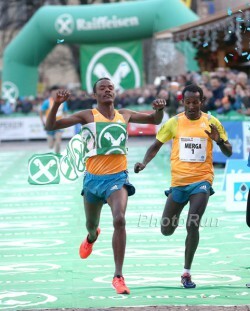 Moses Kipsiro of Uganda added another victory to his impressive resume at the 25th edition of the Bitburger New Year’s Eve Race in Trier. Nazret Weldu of Eritrea won the women’s race. The Ugandan runner and Hailemariyam Amare of Ethiopia dueled in the men’s 8K race, with Moses, the reigning Commonwealth 10,000m champion, eventually winning by two seconds in 23:04. The 28-year-old has now been triumphant at the prestigious event five times (2005-2007, 2012, and 2014), more than any other runner. The race for third place behind the two leaders was between Homiyu Tesfaye and Arne Gabius. Primarily a 1,500m specialist, Homiyu won the contest in 23:17. Arne was credited with the same time. At the end of October, the German athlete made an impressive marathon debut in Frankfurt. Nazret Weldu of Eritrea scored an upset win in the 5K women’s race, clocking 16:01. The 24-year-old recently set a national record of 33:23.93 for 10,000m on the track. Second place went to Yemenu Tewabech who was two seconds behind, while third was awarded to another Ethiopian runner, Weynshet Weldetsadik in 16:06. Kenya’s Cynthia Kosgei was a close fourth in 16:07. Fifth place went to the defending champion, Corinna Harrer, the leading German finisher in the women’s field with a time of 16:09 minutes. New York’s long-established New Year’s Eve race has become a city tradition second only, perhaps, to the New York City Marathon. This year several thousand runners made it an especially festive occasion, setting off at midnight on the 4-mile course through New York’s Central Park. Winners of this highly popular event, which featured fireworks as additional entertainment, were Americans Andrew Colley in 18:24 and Chelsea Reilly in 21:04.